Time and again we hear how useful social media is for library outreach. Use social media for advertising events in the library! Use social media to provide book recommendations! Use social media to alert patrons to library hours and services! Use social media to highlight collections! Dramatics aside, many of us have been in this predicament at some point. We question why we’re doing social media for our institutions. We wonder what its value is, what are its long-term benefits. We wonder if our content is exciting and intriguing, if we post too much or too little, if we should plan in advance or work more spontaneously, if we should have a social media team in place or leave all social media duties to one person, if we are using the right metrics to gauge effectiveness. The list goes on. 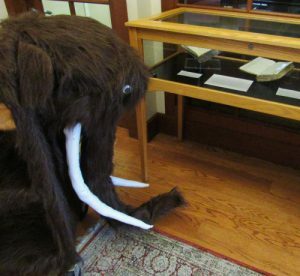 Sharing my library’s collections on Tumblr with Oloch, our woolly mammoth book cart. It’s my intention over the next several months to explore some of these challenges and concerns pertaining to social media and its use in the library. As a social media contributor/administrator at my library, I have grappled with these issues firsthand. My colleagues and I set up a Tumblr blog (Othmeralia) for our library in January 2014 and a Pinterest page in March 2016. They weren’t instant successes by a long shot. Success was brought about through time as well as trial and error – and accompanied by countless conversations about content, best practices, management styles, promotion techniques, and metrics. The tips I’ve gleaned from my library’s social media experience and from my own reading will serve as the basis for this series which will hopefully inform you about how to cultivate meaningful social media presences. Embracing the spirit of sharing that envelops the vast world of social media, I invite you to take part in the conversation as well. Share your institutional social media challenges, share your success stories, share your tips and tricks in the comments below. What social media are you using at your library? What types of content are you sharing? What’s your biggest challenge at present? General information, Original Content marketing, outreach, social media. permalink.